Tonkawa Lodge Assemblies are opportunities for those elected to become members of the Order of the Arrow. Assemblies take place at Lost Pines Scout Reservation in Bastrop. Commonly known as The Ordeal, candidates will meet a series of challenges that will foster self-reflection and test their commitment to a life of cheerful service. For existing members, Assembly Weekend offers a chance to build friendships and serve Scouting in meaningful ways. 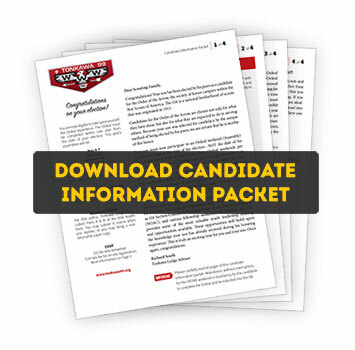 New candidates, please read through the Candidate Information Packet as it contains important details for the weekend. Your first year’s dues are included with your registration fee. Existing members must have paid their dues to attend Assembly. You may pay your dues upon arrival if they haven’t already been paid. More information here. If registering on-site: You must bring a non-returnable copy of your BSA health form (parts A & B only). Check-in is 6:00-11:00 PM on Friday. Expected finish around 11:00 AM on Sunday. Please provide the month and year (ie. July 20XX) of your last YPT training. If you have not taken the course in the past 2 years, please login to your Scouting account and take the course before continuing registration. Money will be collected when you check in. Cash, credit, and checks are accepted. The Brotherhood Candidate fee includes the cost of a new Brotherhood sash. The fee for new members is $55. This covers camping costs, food, OA sash, new member packet, OA pocket flap patch, and your first year's dues. Payment is collected when you arrive. Cash, check and credit card are accepted. Cost: $20. This covers the fee for your new Brotherhood sash. Arrive at camp no later than 9:00 PM on Saturday night. Payment is collected when you arrive. Check-in at the registration table in the Dining Hall to get your wristband. After the closing ceremony, candidates will meet on the porch near the flagpoles to be taken to their Brotherhood ceremony. Your Lodge dues must be current. If not, you may pay them at the same time. Cash, check and credit card are accepted. Cost: $35. This covers camping costs, food, and fee for your new Brotherhood sash. Payment is collected when you arrive. Your Lodge dues must be current. If not, you may pay them at the same time. Cash, check and credit card are accepted. Cost: $25. This covers camping costs and food. Payment is collected when you arrive. Your Lodge dues must be current. If not, you may pay them at the same time. Cash, check and credit card are accepted. I need to update my phone number or mailing address. Tonkawa Lodge uses Remind to send alerts and notifications by text message. Remind is also used by many other groups, schools, teachers. We promise not to blitz your phone, and we'll try not to bother you while you're asleep. Texts are sent by authorized lodge personnel only. I would like to receive an invitation by text message to join the Lodge's Remind service. Please enter the cell number where you would like to receive alerts. This may be a parent's number or something other than your primary number. !!! RENAME YOUR HEALTH FORM !!! Please rename the your health form PDF: "LASTNAME_FIRSTNAME.pdf." This is required so that we can quickly find it in case of an emergency. Right-click or Option-click the file on your computer to rename it. This connection certified secure and your personal information is protected under HIPAA privacy laws. If you prefer, you may bring a non-returnable printed copy of your medical and turn it in during check-in. If applicable, please summarize any medical or dietary concerns that might affect your Ordeal experience. No need for too much detail — good answers might be "vegetarian" or "gluten-free" or "limited mobility." Medical staff will assess your situation on a case-by-case basis as you arrive. Payment is collected at the door. Please note that you have not paid yet. At this stage, we do not offer online payments for OA events. We accept check, cash, and credit card, which will be collected when you arrive. New candidates MUST check in between 6:00 – 7:00 PM on Saturday. No later than 7:00 PM. Existing members may check in anytime. Expected finish by 8:00 PM on Sunday.